Pours a very pale yellow color producing almost no head aside from a bustling of bubbles on top that quickly dissipate. After just a few seconds, the beer has settled completely still with no visible head or lacing. Aroma is fruity but not too sweet with definite notes of peach. Light straw malts round out the nose. Initial taste is tart with sharp peach tang that grows into sour at the finish with supreme effervescence. 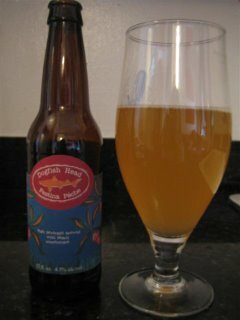 Light and refreshing, there\'s a slightly oily to dry mouthfeel with strong carbonation.